The Policy applies solely to information we collect through the Site. 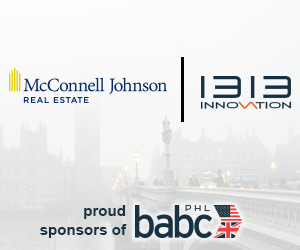 Service is the https://babcphl.com website operated by the British American Business Council of Greater Philadelphia. Personal Data means data about a living individual who can be identified from that data (or from that data and other information either in our possession or likely to come into our possession). Usage Data is data collected automatically that is generated either by the use of the Service or from the Service infrastructure itself (for example, the duration of a page visit). Cookies are small pieces of data that a website transfers to a user’s device (computer or mobile device) for the purposes of storing information about a user’s preferences. Data Controller means the natural or legal person who (either alone or jointly or in common with other persons) determines the purposes for which and the manner in which any Personal Data are, or are to be, processed. Service Provider (also known as a Data Processor) means any natural or legal person who processes the data on behalf of the Data Controller. User (also known as a Data Subject) is any living individual who is using our Service and is the subject of Personal Data. We also collect Cookies and Usage Data, including your Internet Protocol (“IP”) address, browser type, and web log data (see the section of this Policy on Usage Data below for more details). If you choose to give us Personal Data, we may use that Personal Data to correspond with you, provide you with requested materials, and contact you with newsletters, marketing or promotional materials, and other information that may be of interest to you. You may opt out of receiving any, or all, of these communications from us by following the unsubscribe link or instructions provided in any email we send. Each time you visit the Site, we collect some information to improve the overall quality of your online experience, including Usage Data, which may include information such as your computer’s IP address, browser type, and browser version; the pages of our Service that you visit; the time and date of your visit; the time spent on those pages; unique device identifiers; and other diagnostic data. Aggregated Data. We collect aggregate queries for internal reporting and also count, track, and aggregate a visitor’s activity into our analysis of general traffic flow at the Site. To these ends, we may merge information about you into aggregated group data. In some cases, we may remove personal identifiers from Personal Data and maintain them in aggregate form that may later be combined with other information to generate anonymous, aggregated statistical information. Such anonymous group data may be shared on an aggregated basis with our affiliates, business partners, Service Providers and/or vendors; if such data is shared, we will not disclose your individual identity. Web Server Logs and IP Addresses. An IP address is a number that automatically identifies the computer or device you have used to access the internet. The IP address enables our server to send you the web pages that you want to visit, and it may disclose the server owned by your internet service provider. We may use IP addresses to conduct website analyses and performance reviews and to administer the Site, though we will not combine traffic data with User accounts. Cookies, Web Beacons, and Other Tracking Technologies. A “Session Cookie” is one that exists for the period that your browser is open. A “Persistent Cookie” is one that is saved on your device/computer even after the browser is closed. Like many websites, we may use both Session Cookies and Persistent Cookies. We also use Security Cookies for security purposes. Some of the Site’s web pages may use web beacons in conjunction with Cookies to compile aggregate statistics about website usage. A web beacon is an electronic image (also referred to as an “action tag,” “single-pixel,” or “clear GIF”) that is commonly used to track the traffic patterns of users from one web page to another in order to maximize web traffic flow and to otherwise analyze the effectiveness of a website. Some web beacons may be unusable if you elect to reject their associated Cookies. Tracking technologies also used are tags and scripts to collect and track information and to improve and analyze our Service. To serve you third-party advertisements (see the section of this Policy on Third-Party Advertising below for more details). If you provide your email address, we may send you administrative and promotional emails. Where required in the relevant jurisdiction, we will obtain your consent before sending you promotional emails. If you wish to opt out of promotional emails, you may do so by following the “unsubscribe” instructions in the email. or other purposes: subject to applicable law, we may use your Personal Data for additional purposes in connection with our organization, where you have provided your prior consent. We will also retain Usage Data for internal analysis purposes. Usage Data is generally retained for a shorter period, except when this data is used to strengthen the security or to improve the functionality of our Service, or we are legally obligated to retain this data for longer periods. We are located in the United States and are subject to the applicable laws of the United States (where data-privacy laws may be less stringent than in your country of residence). If you are visiting the Site, or any part thereof, from outside the United States, please be aware that your information, including Personal Data, may be transferred to, stored, or processed in the United States, where our servers are located and our central database is operated. By using the Site, you understand and consent to such transfer, use and disclosure of your information to our facilities in the United States and those third parties with which we share it as described in this Policy (who may also have less stringent data privacy laws than those of your country of residence) and subject to such applicable laws. We may share your Personal Data under confidentiality agreements and any legally required data-processing agreements with other companies that we work with, or that work on our behalf, to provide products and services, such as those that are providing email solutions, providing cloud hosting services, providing payment processing, monitoring and analyzing data and usage of the Site, or providing support and maintenance services for the Site, as well as legal, regulatory, audit and other professional advisors. These companies may use your Personal Data to assist us in our operations or for our legitimate business interests. However, these companies do not have any independent right to share this information. Among other third-party Service Providers, we may use Google Analytics to monitor and analyze the use of our Service. Google Analytics is a web analytics service offered by Google that tracks and reports website traffic. Google uses the data collected to track and monitor the use of our Service. This data is shared with other Google services. Google may use the collected data to contextualize and personalize the ads of its own advertising network. Further, we may provide paid products and/or services within the Service. In that case, we use third-party services for payment processing (e.g., payment processors). We will not store or collect your payment card details. That information is provided directly to our third-party payment processors, whose use of your Personal Data is governed by their Privacy Policies. These payment processors adhere to the standards set by PCI-DSS as managed by the PCI Security Standards Council, which is a joint effort of brands such as Visa, MasterCard, American Express and Discover. PCI-DSS requirements help ensure the secure handling of payment information. The security of your Personal Data is important to us but remember that no method of transmission over the internet or method of electronic storage is 100% secure. We have put in place appropriate security measures to prevent your Personal Data from being accidentally lost, used or accessed in an unauthorized way, altered or disclosed. In addition, we limit access to your Personal Data to those employees, agents, contractors and other third parties who have a business need to know. They will only process your Personal Data on our instructions and they are subject to a duty of confidentiality. While we strive to use commercially acceptable administrative, technical and physical safeguards designed to protect your Personal Data, we cannot guarantee its absolute security. Some web browsers may transmit “do not track” signals to the websites with which a User communicates, though web browsers incorporate and activate this functionality in different ways, and it is not always clear whether users intend for these signals to be transmitted. There currently is a disagreement, including among participants in the leading internet standards-setting organization, concerning what, if anything, websites should do when they receive such signals. We currently do not take action in response to these signals, but if and when a standard is established and accepted, we may reassess how to respond to these signals. If you are a resident of the EEA, you have certain data protection rights. We aim to take reasonable steps to allow you to correct, amend, delete, or limit the use of your Personal Data. The right of rectification. You have the right to have your Personal Data rectified if that data is inaccurate or incomplete. The right of restriction. You have the right to request that we restrict the processing of your Personal Data. The right to withdraw consent. You also have the right to withdraw your consent at any time where we relied on your consent to process your Personal Data. If you have any concerns regarding how we are handling your Personal Data, please contact us. We will strive to deal with your concerns promptly. You have the right to complain to a supervisory authority about our collection and use of your Personal Data. For more information, please contact your local data protection authority in the EEA. We will occasionally host third-party advertisements, conduct independent traffic analysis, or host outside media campaigns. While this content is not under our direct control, we value the integrity of our Site and your privacy concerns. Outside entity advertisements conform to the guidelines and opt-out functionality supplied by the Network Advertising Initiative. To opt out of the initiative’s campaigns, please visit the opt-out section of its website, www.networkadvertising.org. Under Age 13. We do not knowingly collect or retain Personal Data about persons under 13 years of age. Any person who provides his or her Personal Data to us via the Site represents that he or she is 13 years of age or older. We encourage parents and legal guardians to monitor the activity of those under 13 years of age. If you have reason to believe that a child under the age of 13 has provided Personal Data to us without parental consent, please contact us, and we will make every effort to delete that information from our databases. It is not our policy to intentionally collect or maintain information about anyone under the age of 13. No one under the age of 13 should submit any Personal Data to us or the Site. Under Age 18. We do not knowingly collect personally identifiable information from anyone under the age of 18. If you are a parent or guardian and you are aware that your child has provided us with Personal Data, please contact us as specified in the Contact Us section of this Policy and request deletion of that Personal Data. If we become aware that we have collected Personal Data from children without verification of parental consent, we take steps to remove that information from our servers. Please note that, while we make reasonable efforts to comply with such requests, deletion of your Personal Data does not ensure complete and comprehensive removal of that data from all our systems and back-up systems. Under the GDPR and applicable European data privacy laws, children between the age of 13 to 16 in the EEA may provide valid consent to process their Personal Data. Where consent is required under such applicable European data privacy laws, you have the obligation to provide to us evidence of such consent, or as required as under the applicable European data privacy laws, the authorization of the holder of parental responsibility for the child. We may refuse to process, or continue to process, the child’s Personal Data until we receive this evidence of consent or authorization. At certain locations on the Site where information about you may be requested, you are offered the opportunity to opt out of receiving communications from us. You may also review and request changes to your Personal Data that we have collected, including the removal of your Personal Data from our databases in order to prevent receipt of future communications, by contacting us at privacy@babcphl.com.